In 1956, a twenty-one-year-old Elvis Presley was at the beginning of his remarkable career. 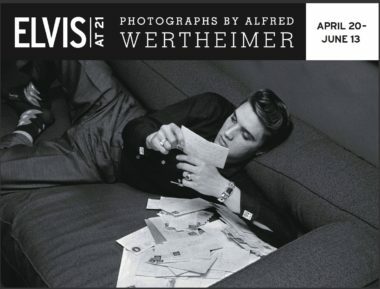 Up-and-coming photographer Alfred Wertheimer (American, 1929- ) was asked by Presley’s new label, RCA Victor, to photograph the “Hillbilly Cat” rising star from Mississippi. Wertheimer traveled with Elvis Presley, capturing the unguarded moments in Elvis’s life during that crucial year, a year that took him from Tupelo, Mississippi to the silver screen, and to the verge of international stardom and his crowning as “The King of Rock ‘n’ Roll.” These Wertheimer classic images represent the only candid photos of Elvis ever taken. Shortly after, Elvis’s manager, “the Colonel,” restricted access to the young singer. From backstage to onstage, from piano benches to Harleys, from on-the-road to screaming fans, Elvis at 21 presents 40 large-format photographs that chronicle with cinematic luminosity, a remarkable time when Elvis could sit alone at a drugstore lunch counter. Elvis at 21, Photographs by Alfred Wertheimer was developed by the Smithsonian Institution Traveling Exhibition Service, Govinda Gallery, and the Smithsonian’s National Portrait Gallery, and is made possible through the generous support of HISTORY™. One of South Florida’s finest cultural attractions, the Boca Raton Museum of Art presents changing exhibitions of national and international importance, and a wide range of educational programs, lectures, gallery tours, and studio art classes. The Museum’s permanent collection includes a superb assembly of modern masters including works by Degas, Arman, Matisse, Modigliani and Picasso; important American and European modern and contemporary works by artists ranging from Louise Nevelson to Andy Warhol; an outstanding photography collection; and important collections of Pre-Columbian and African art. MDG Advertising, a full service Florida ad agency with offices in Boca Raton, FL and New York, NY, will roll out the advertising campaign for the upcoming “Elvis at 21” exhibition at the Boca Raton Museum of Art. MDG handles all creative advertising, collateral design, transit advertising and media planning and buying for this wonderful, non-profit cultural institution in Boca Raton, FL. Michael Del Gigante is president and executive creative director of MDG Advertising. MDG Advertising, a full-service South Florida advertising agency, specializes in developing targeted integrated online marketing solutions, exceptional creative executions and solid branding and media buying strategies that give clients a competitive advantage. For more information, call 561-338-7797 or log on to mdgadvertising.com.